Remember this box of cherry goodness I got from my friend Kirsten at Comfortably Domestic? She held a giveaway to highlight local Michigan cherries from one of her favorite companies, The Cherry Republic. I thank my lucky stars every day that her brilliant son pulled my name from that hat. It has truly been a gift that keeps on giving. I started on the bag of dark chocolate-covered cherries first, since I could not resist them. Oy vey! They were spectacular. So much so, I haven’t been able to stop thinking about them. Next up? The bag of mixed nuts and dried cherries. The nuts were raw, and I like mine roasted, so I simply separated out the cherries, threw the nuts into a dry skillet, and toasted them until they smelled heavenly. Once they cooled, I mixed the cherries back in and stored them in a jar to keep them fresh. These are great for snacks or as an oatmeal topper. But I still couldn’t stop thinking about dark chocolate-covered cherries. So what does a girl do when she has a jar full of toasted nuts and dried cherries, but chocolate on the brain? That’s right, you clever little minxes. She smothers them in dark chocolate. So, without further ado… I give you Tart Cherry Chocolate Bark. Shazam! 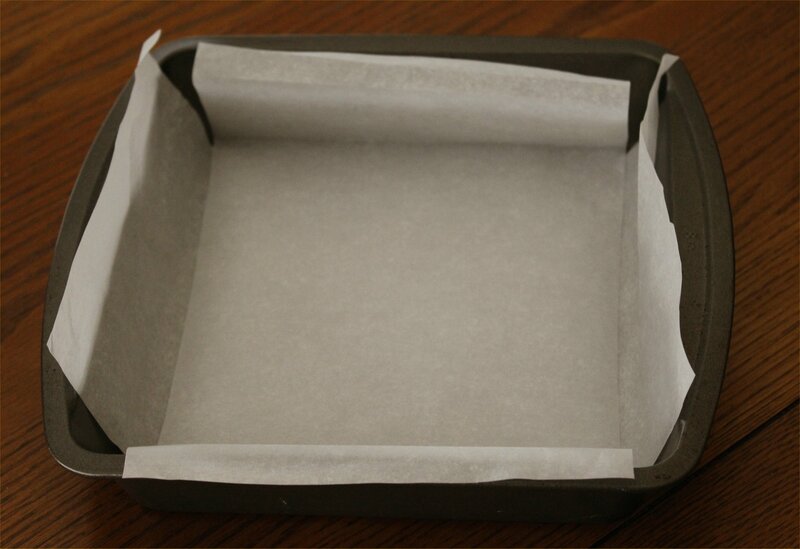 Start by lining an 8″ square pan with parchment paper. It’s easiest if you cut two strips and lay them in opposite directions. Did you know that cellophane tape will not stick to parchment paper? Neither did I. Lesson learned. Using a double boiler or a metal or glass mixing bowl over a pan of boiling water, melt your chocolate then whisk until smooth. Be careful not to burn yourself, either on the hot mixing bowl or the steam. Once your chocolate is creamy and smooth, remove the bowl and set it on a kitchen towel. Next up, grab your cherry and nut mix. The Cherry Republic version is awesome. Notice those gorgeous tart cherries and those giant nut halves? No little bits or pieces here. 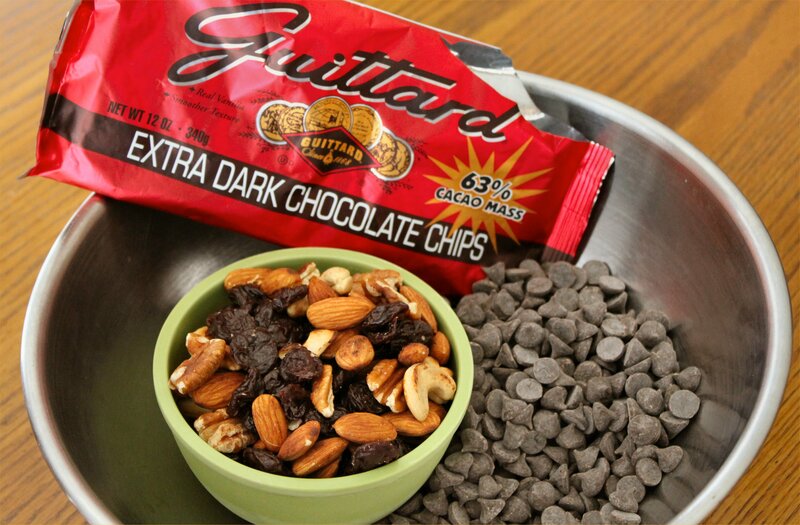 Add your cherry & nut mix to the melted chocolate and stir until well combined. Pour it into your prepared pan and flatten it with a spatula until it’s about 3/4″ thick. Put it into the refrigerator to set up for about an hour. Once it’s set, remove it from the pan and cut it into squares with a sharp kitchen knife. Store in an airtight container. I like to keep mine in the refrigerator since it’s so dang hot in Houston. And that’s it! The only thing left to accomplish is a little self-restraint. Can’t help you there, but I wish you luck! Lots of luck. Stay tuned. The last item from the gift box is a jar of cherry chipotle salsa, and there’s no telling what’s going to happen with that! Thanks again, Kirsten. Your taste in cherries is impeccable. Wow that chocolate bark looks delicious! I’m going to have to order some dried cherries. It’s pretty darn good, if I do say so myself. 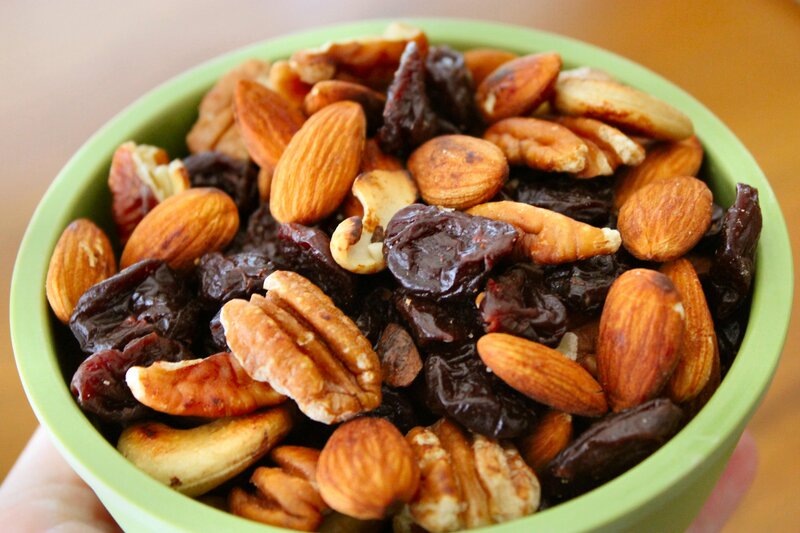 The key is to use good quality dried fruit & nuts, and pick a chocolate chip you really enjoy. Other than that, it’s incredibly easy. Hope you like it! Mmmmm…I got excited just reading the title of this post. And now that I’ve read the recipe and seen the pics, I’m even more excited. Yeah…. chocolate excites me like that, too. DANG IT!! I knew there was something else I wanted to buy when I was in Houston. 20 bags of Guittard chocolate chips or 100, whichever! Remind me before Thanxmas, and I’ll bring you some. Put it on your calendar right now!!! C’mon, Pat! You’re always welcome to drop in any time something looks good! There’s a bonus gift if you do. I made my first pineapple pie today. Ouch! It would be a lot easier to just make bark. Especially since it’s the easiest candy in the world to make. Melt, mix, pour, chill, cut, done. I’m glad you found it so irresistible, though! You. Are. A. Genius. For toasting the nuts, and then encasing them in dark chocolate. 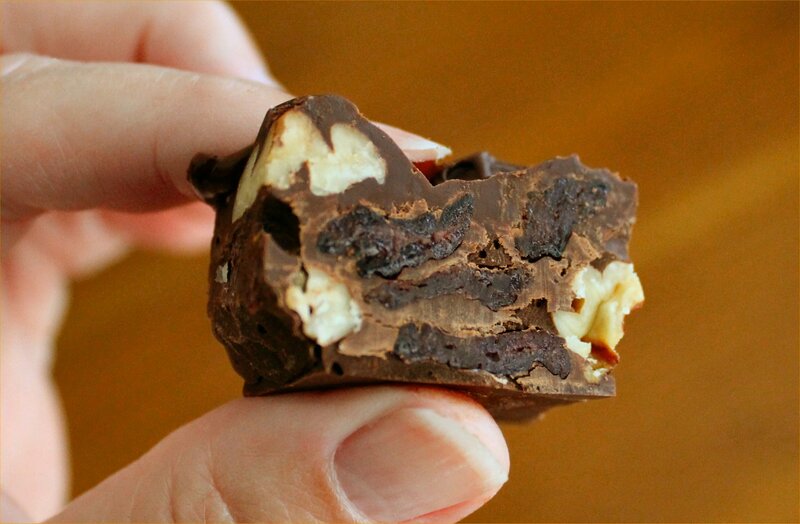 You just made your very own Chunky bars. LOVE it! 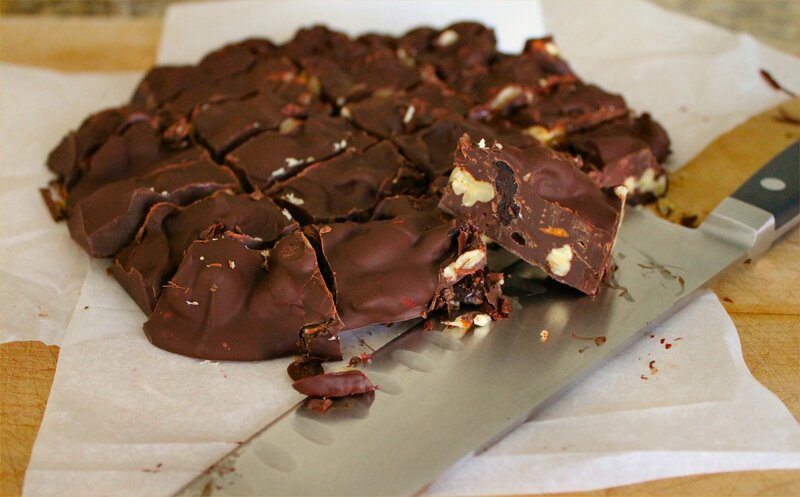 I love whipping up some chocolate bark, because it is so flippin’ easy. I don’t do it often though, because self restraint is not my thing. That cute little 8 x 8 pan wouldn’t last a week around here–and not because I shared it with my family. Thanks for the shout-out to Cherry Republic, too. They’re good people. They help a lot of small local farmers and businesses by paying a more than fair price for their cherries and labor. They also donate 1% of every sale to local land conservancies for the preservation of farmland in northern Michigan. No, Kirsten…. YOU are a genius for hosting such a fabulous giveaway. I’m incredibly lucky to have won it, and extremely grateful that I was able so sample such wonderful products from The Cherry Republic. They now hold a very special place in my heart, along with your beloved Michigan cherries. For other readers, if you haven’t checked them out, you need to. What a great way to support local farmers AND consume some world-class cherries! I wish I had a good suggestion for the salsa, but I’m basically paralyzed, thinking of the different ways you could use it! I’m glad to be one of your kitchen “anchors” – what an honor! If you’d had those glorious dark chocolate-covered cherries, you’d know the bark wasn’t such a stretch of imagination. It was really a no-brainer. 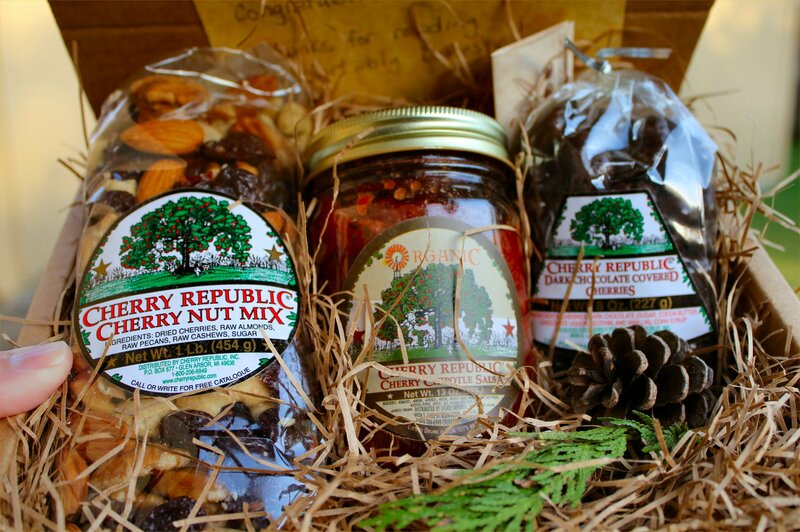 Kirsten is the real genius for sharing her love of Michigan cherries and The Cherry Republic. If it weren’t for her, I’d be eating a bite-sized Milky Way Midnight instead. God bless her! As for the cherry chipotle salsa, I think a smoked pork tenderloin might be a good option. I’ll keep you posted. That bark looks delicious. I’m going to have to will Kirsten to have another contest, and her son to pick my name this time. Wonderful! Good luck, Beth! If you can’t convince Kirsten to give away another box of cherry goodness, you can always have The Cherry Republic ship the same gift box to your house. It won’t be free, but it will be delicious (and totally worth it).